If you desire energy efficiency in your Rhode Island replacement windows, look no further than our casement models. Tall and thin, these windows open outwards centrally by a rotating crank to welcome cool air into your home. The fresh scent of outdoors is within your grasp with casement windows, suited for placement over cabinets or wherever vertical opening is difficult. Listed is our selection of casement windows. To learn more about our casement windows, give us a call or fill out our request a quote form. 100 Series: This model will not crack, peel, blister, fade, or flake; it is comprised of our strong and durable Fibrex™ material and is also available in a stationary option. 400 Series: Unobstructed view and an easy single-actuation locking system distinguish the 400 series. Choose from white or natural pine interiors. 400 Series Complementary Casement: The old saying, “two is better than one,” applies to the complementary casement model; utilizing a tradition French style, a twin sash inside a single frame allows for unobstructed view through both panes. A Series: Accent your home with the traditional architecture by way of a tall bottom rail and natural maple, oak, and pine interiors. A Series Complementary Casement: Modern ease with traditional French appeal; like the 400 complementary series, this model features a twin sash in a single frame to offer an unobstructed view. Any of our casement models will direct airflow through your home. 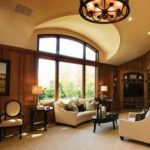 Avoid dirt and debris invading your home with superior sealant and enjoy cozy moments during the cold months from the pinnacle in energy efficient replacement windows for Rhode Island residents. Like all of our windows, Renewal casement windows are crafted from the latest and greatest in glass and frame technology. Our Fibrex™ material will maintain its color and strength far longer than any wood or vinyl. Renewal casement windows are both durable and energy efficient, utilizing the full benefits of their “Low-E” glass and insulated frames. Plus, as with all of our windows, our casement windows are backed by the deepest warranties in the industry. With our casement windows you’ll reap the benefits of quality products that are fully protected for years to come. To learn more about replacement windows in RI or MA, call Renewal by Andersen of Southeastern Mass and Rhode Island to schedule your free in-home with our local window experts. Complementary Consultation in Southeastern Mass and Rhode Island Contact Us Today! Renewal by Andersen of Southeastern Mass and Rhode Island leads as experts in doors and windows. We have deep roots to the local MA and RI communities, and work tirelessly to improve the homes of our neighbors. Call us at 401-473-2739 to set up your free, no obligation in home consultation on replacement windows in MA or RI. Address : 10 Reservoir Road, Smithfield, RI - 02917 US. No showroom, visits by appointment only.